Sankranti is celebrated for three days. The first day of the three days of Sankranti is known as Bhogi. 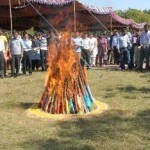 Bhogi in this year will be celebrated on Wednesday, 13th January, 2038. Bhogi is famous in Andhra Pradesh. The common rituals involve of lighting the night fire. The fire is lit using the old articles in the house in the early hours of the Bhogi day . People also celebrated by drawing big Rangolis in front of the house. There are competitions in drawing the Rangolis. It is a ritual to place small cones made out of cow dung in the middle of the Rangoli. These are worshipped as a form of Goddess Lakshmi. In the evening of Bhogi, it is a ritual to pour Regi Pallu or bear fruits on children. It is believed that by doing this on Bhogi will ensure that no evil will reach the children. Kite flying would start on Bhogi.